This photo was taken at 5 pm on July 24, 2012. The location was in the living room of my home in Bethesda, Maryland. The "Take It!" 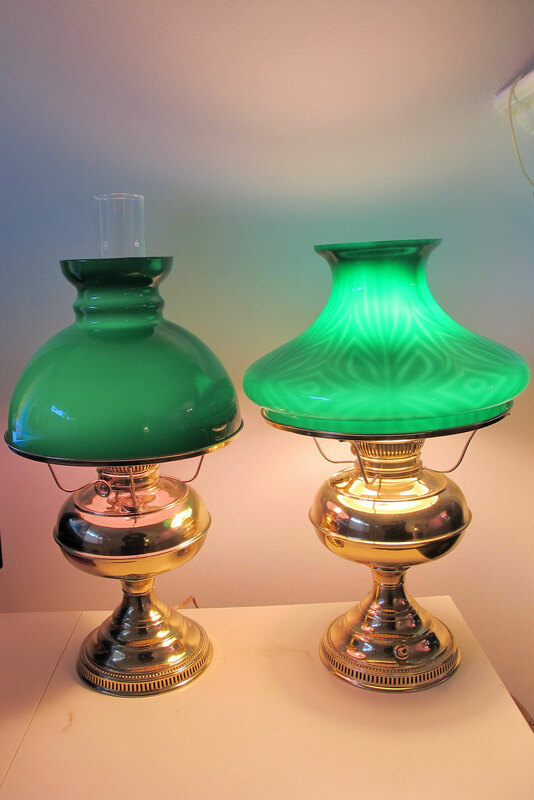 came from having gotten two antique formerly kerosene lamps restored to their original luster. The first one that was polished had already claimed a prominent location in the living room when the second one came along having taken about a month to go through the process at a local plating shop. These were just two of the lamps which I had inherited from my parents estate. The second lamp after having been picked up sat unused for several months while I searched for a location in which to place it. At this point in time I still have not found a place for it but decided to put the two together and have some fun in sharing them with everyone. The After Take: I enjoyed the process of placing the chimney and shade onto the second lamp for this little in house photo shoot. The old memories of my Mother finding these lamps in Antique stores and bringing them home came flooding back to me. There was some type of accident with the lamp that has the rounded shade and a new one was ordered. Even though I was still a child, I remember it taking a seemingly impossibly long time to arrive. I can only guess that I had something to do with it breaking in the first place (memory repression at its best here - lol) Well, it arrived and I had how expensive this replacement had been duly impressed upon me. It still has the "Made in France" sticker on this double hand blown shade. The first blown piece was the outer green glass. This piece was then followed by a second blowing of white glass within the green glass until it perfectly contoured to the inside of the green outer shell. It is amazing to me that the shades on both of these lamps have survived as they were shipped back and forth across the country twice. A very special thanks to the plating shop for bringing these back to there shine of long ago. I was told by the proprietor of the shop that this cleaning and buffing process should find the lamps looking good for at least twenty years. Rare is the opportunity to listen to such a claim which was issued in a matter fact way that had just a hint of pride within it. Needless to say my thanks was while not profuse, filled with appreciative wonder and muted awe at being able to take something like that home with me. Here is hoping you too have something old that with some help can be made almost new again. Thanks for joining us for the current photo presentation. You are cordially invited to return Tuesday, November 13th for a new picture that we hope you will enjoy. Those are very pretty lamps, they almost look new. I have a room in my house that is completely filled with things from the roaring 20's. I really think those would look nice in said room. Those seem like they are some quality antiques. Wow lol, seems like you all want a lamp!